I am at Defcon One, Maximum Force Readiness. I be Traveler, a.k.a. HoboTraveler.com. There are various types of travel problems and dangers. I am presently in Defcon 1 level of readiness to protect myself. I am not in danger of getting hurt. I am not in danger of being robbed. I am not in a medical danger. I am not in any mental conditional danger. I am in the biggest danger and most common problem. I am in danger of accidentally or with a little help danger of losing things. In my guesstimate, the 90 percent of all travel crime is not crime, but the person misplacing or losing an item then assessing their own problems, and blaming outside factors for their own lack of travel skills. I for sure lose 9 items to 1 item stolen, no that is not correct. I lose maybe 50 to 1. Recently I lost a sweatshirt on the bus with Andrew on the way to Koh Phi Phi, Thailand. We left the bus without removing the sweatshirt from the pocket on the back of the seat. It was in Andrew Box area after I moved, so he did not assess the situation in his area... aagh! Traveling with another person doubles my chance of losing things; unless they work as a team then it lessens. 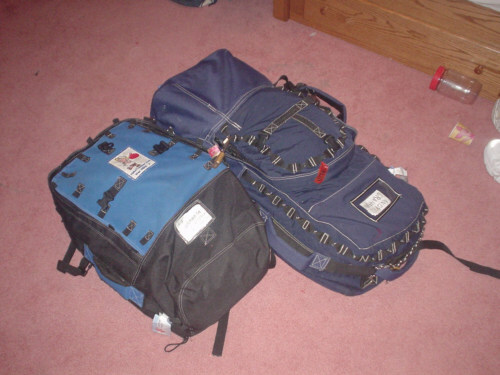 “I am going to lose things inside my backpack." I am borrowing Kylas room a five-year-old over zealous, too energetic girls, should not give sugar to for any reason young, excessively smart child. I sleep in the room; however, she comes in to RETRIEVE HER TOYS. 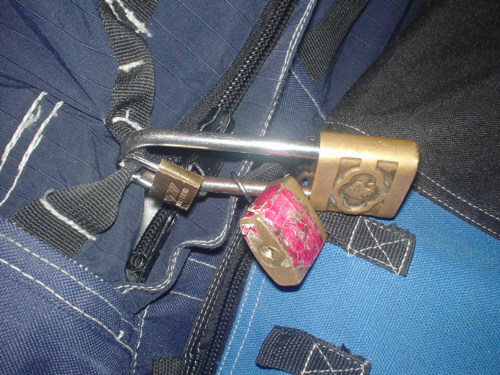 I have gone into complete lockdown of my personal items, I have taken my two backpacks and stuff anything I am not willing to donate to Kyla in the bag, then locked them shut, locked them together. Now the only worry is she does not use the bag for a seat, bed, or trampoline. To enjoy life, I secure safety first, and then go for the joy, if you do not feel safe, very difficult to attain happiness when traveling. My guess though is 90 percent of travelers live in either denial of danger or low-level fear, masked again by denial. I am bewildered why they will not admit they are afraid. I am presently in extreme fear of losing items in my bag, now with my new level of readiness I am back down to almost ZERO level of fear. To me the greatest need of a human, to feel safe. Intimacy is after that…the meeting of the minds. DEFCON 1 - Maximum force readiness. Bag bundled into a group and ready, I put in this formation often in the Airport, always in Bus or Train Station, waiting in any park. The long shank lock is a SOP, Standard Operating Procedure for me.